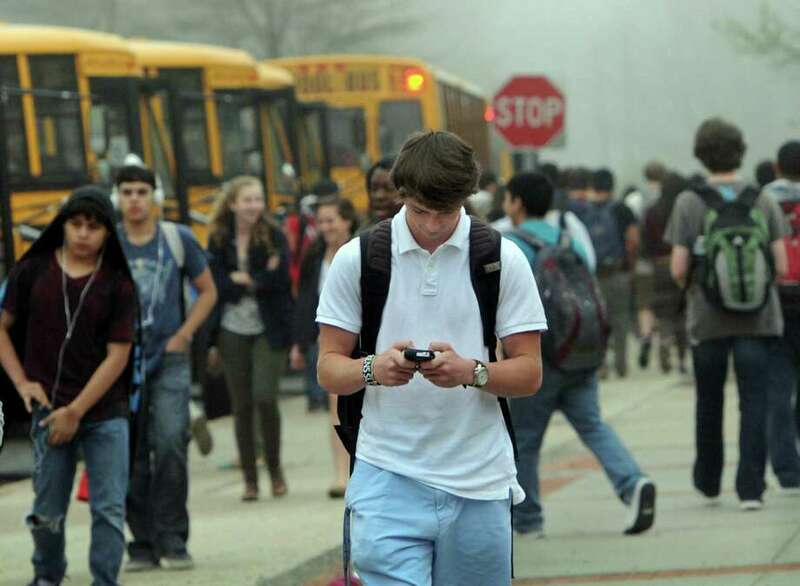 The New Canaan High School administration is seeking to block a new location-based smartphone app that can be used for anonymous cyberbullying. A new location-based smartphone app aimed at students is under fire in New Canaan for enticing cyberbullying. Following a number of complaints from New Canaan High School parents, the district is currently working to block Streetchat, which allows anonymous postings of photo messages. "A number of these postings have referenced students and faculty at NCHS in mean-spirited, offensive, inappropriate, and even hurtful ways," Veronica LeDuc, the school's acting principal, said in a letter to parents last week. "The administration is working with our IT staff and local law enforcement in an attempt to block access here at school and to determine how postings directed at individuals can be removed." The app uses GPS coordinates to pin students' locations and create a list of nearby schools. Streetchat lets users create public postings or send direct messages to other users, but many students have used the app to bully or share jokes about their classmates, teachers or school staff. Sgt. Carol Ogrinc, youth officer with the New Canaan Police Department, said she has received a handful of complaints while other parents have also contacted School Resource Officer Jason Kim. "A lot of parents are concerned because there are very inappropriate messages, comments, photos being posted about students, teachers and people in the community at random," she said. "It's hurtful to kids. It's really a coward way of bullying." Blocking Streetchat would essentially add the app to a digital fence, which currently blocks Facebook and other social media websites from school properties. According to Ogrinc, if there is a serious report of harassment, threatening or cyberbullying stemming from Streetchat posts, the department would pursue a full investigation to identify the sender, who could face charges. In Norwalk, a 14-year-old student at Brien McMahon High School is facing a misdemeanor harassment charge after police said she used Streetchat to post photos of a teacher with sexually charged captions, according to The Hour. Although the app's terms and conditions warn users not to post illegal or illicit content, Streetchat does not monitor the postings. The app is similar to Yik Yak and Gaggle, two anonymous message-board apps that rocked many schools in the area last spring. At Staples High School in Westport, the apps had to be quickly blocked after malicious postings triggered reactions that "brought the school to a halt," as Principal John Dodig put it in April. Ogrinc said this type of app is "something that's always being replaced" and will "die down like everything else does." But while it's going on, she said, parents should work with their children to make sure they're not involved in cyberbullying. "We're asking parents to help out and have a conversation with their children," she said, adding that parents should regularly check their children's cellphones to make sure the kids are using them appropriately. Students at Saxe Middle School may also be using the app, Ogrinc said, but she still has not heard any complaints from there. LeDuc, who was not available for comment, urged parents in her letter to convince their children to delete the app from their phones. "In the event that you are hearing about this app or your child has experienced any difficulty with postings on it, we wanted to bring this to your attention and to ensure you that we are taking steps to limit access and protect our students from the postings on this new app," she wrote. "Furthermore, we are requesting your assistance by asking you to speak with your child about the damaging impact these negative postings can have on their classmates, and to encourage them to remove this app from their devices, if it is currently installed, in order to diminish its ability to hurt others in the future."